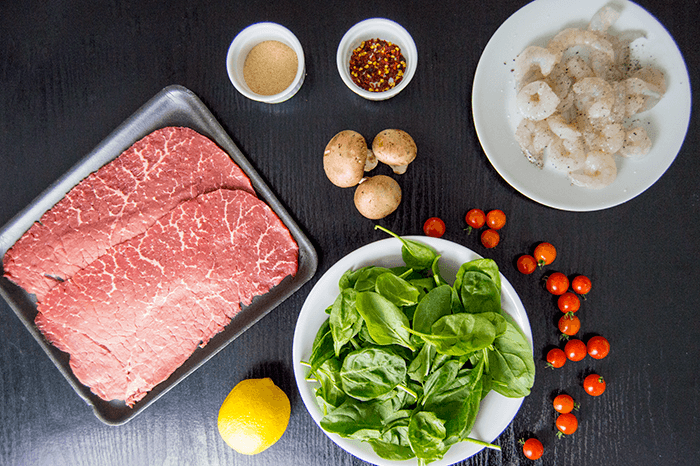 If there's one thing I love more than shrimp, it's steak. 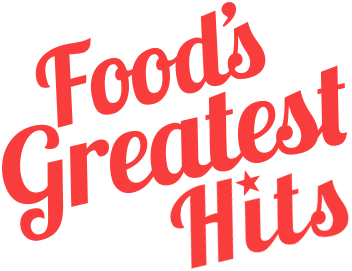 I'm also a sucker for surf 'n' turf recipes. 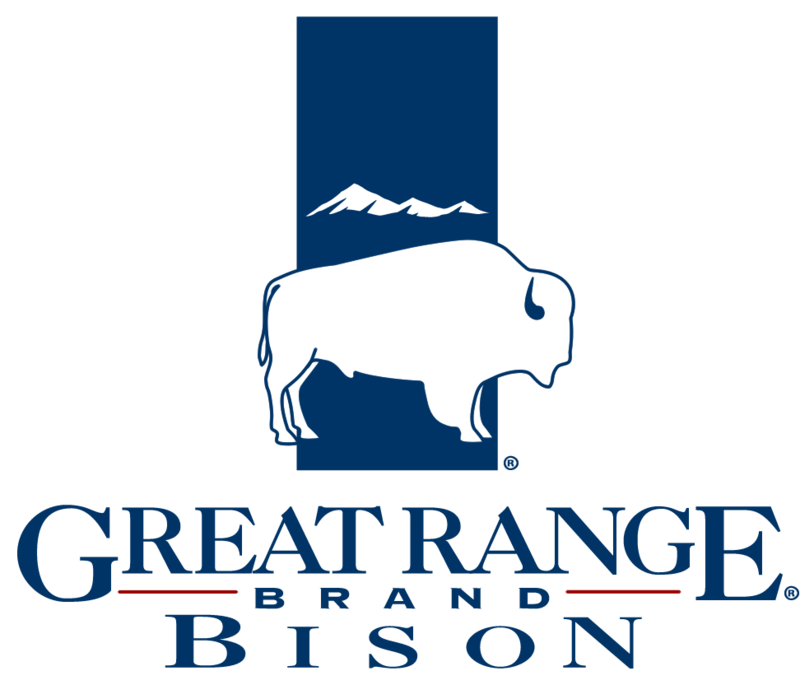 Recently there was a sale on super thin sirloin at my local grocery store and I had a light bulb moment when I picked up the package, so immediately popped it in my basket while I formulated a recipe in my head. I picked fresh cherry tomatoes from my garden and paired them with some spinach, mushrooms, lemon juice and red pepper flakes. 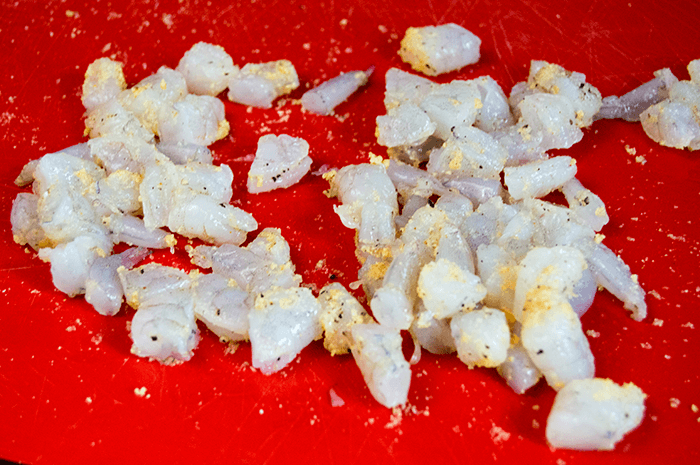 Finely chop the shrimp so the pieces are smaller than a half inch in size, the smaller, the better. Season the chopped shrimp with the garlic powder and salt and pepper. 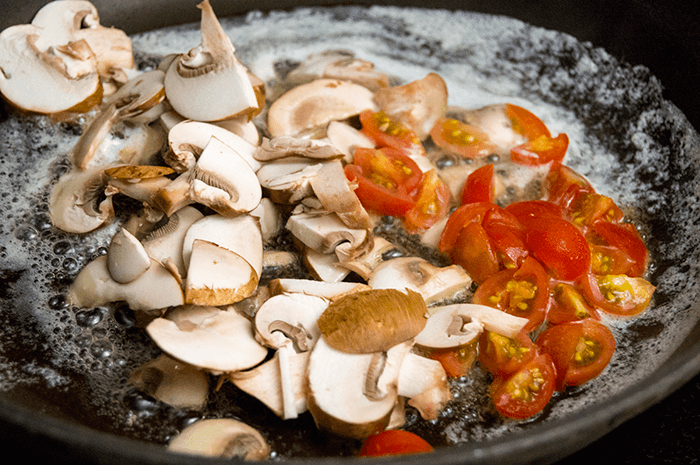 Saute the mushrooms and tomatoes in some butter or olive oil until they've started to brown and lose their moisture. 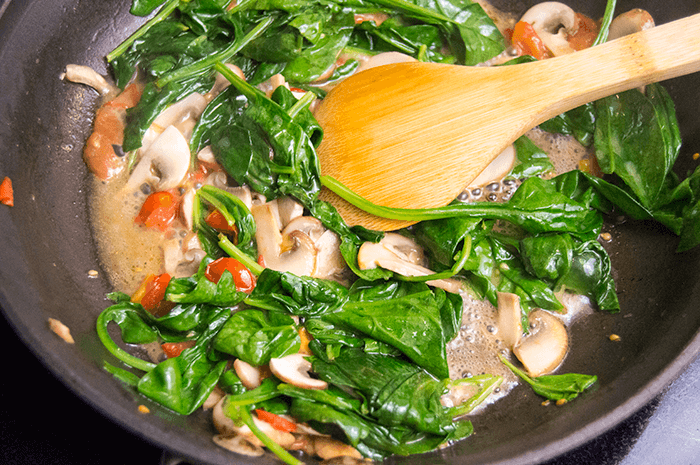 Add the spinach and gently fold it into the mushrooms and tomatoes. It will wilt quickly, so take care not to over-stir! Let some of the liquid evaporate from the skillet before removing it from the heat. 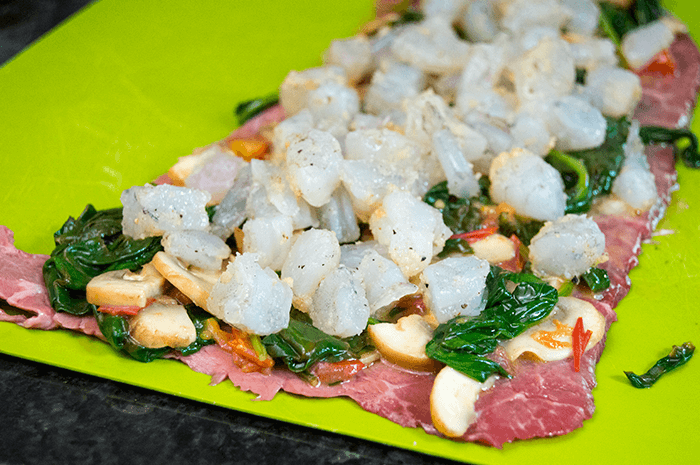 Spread the spinach mixture across the top of the sirloin, followed by an even layer of shrimp. 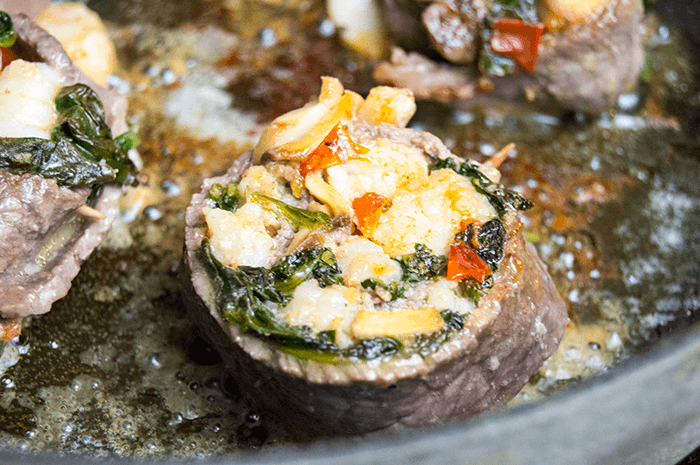 Gently roll the sirloin around the shrimp and spinach. 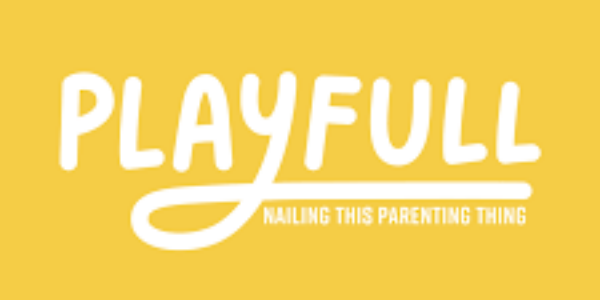 Use toothpicks to secure the sirloin in place so it's easier to cut into individual portions. Finally, sear the sirloin wrapped shrimp for 2-3 minutes per side, or until the sirloin is no longer pink and the shrimp has been cooked through. I recommend using tongs to help flip the pinwheels while cooking, otherwise you may lose some of the filling when you flip! Roughly chop the shrimp into quarter inch pieces. Season with garlic powder, salt and pepper. Wash and chop the mushrooms and tomatoes. Preheat the olive oil over medium high heat until shimmering. Add the mushrooms and tomatoes and saute until the mushrooms have lost their moisture. 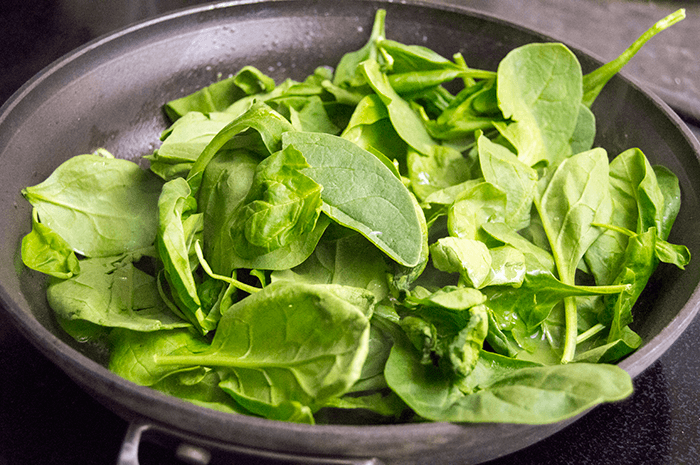 Add the spinach to the skillet and gently stir until the spinach has wilted. Let any excess moisture evaporate from the skillet then remove from the heat. 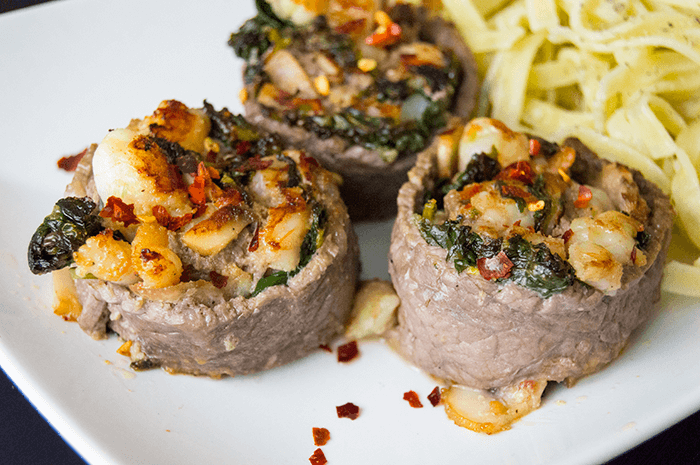 Spread the spinach mix in an even layer over the top of the sirloin. Place the chopped shrimp on top. 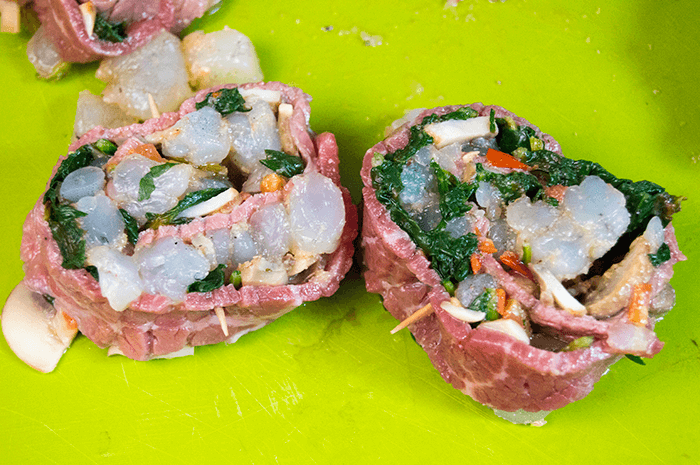 Roll the sirloin around the shrimp and spinach in to a pinwheel shape. Secure the meat together with toothpicks, then cut into individual portions about 2 inches thick. Sear the pinwheels on each side for 2-3 minutes or until the beef is no longer pink and the shrimp are cooked thoroughly. Serve right away. Enjoy!